Typically the Showman’s Show, which Etherlive exhibited at in October 2009, is a rather rainy old affair bringing together the leading outdoor and indoor event suppliers at the Newbury Showground. This year the dark clouds held long enough to give exhibitors and visitors a chance to see the latest market innovations in some British October sunshine. We exhibited in both the outside and inside areas. The outdoor space meant that we could demonstrate to customers the new Ecolite P Plus tower light, combining lighting, CCTV, public address and network access in one palletized unit. The revolutionary unit received very positive reviews especially around its efficiency and simplicity. Also on display outside was the Mobile Command Centre (MCC), the network centre which keeps the largest events up and running with server racks, high speed networking, real-time monitoring and working space for operational teams. 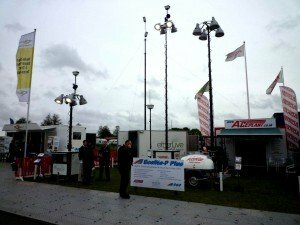 Indoors we demonstrated the latest POD units which have been providing connectivity for many of the UKs leading outdoor and indoor events this year. The current generation includes a solar panel, part of a focus from Etherlive to provide event customers with the most environmentally conscious solutions on the market. With the panel, combined with the existing battery, the unit will run non-stop for several weeks even with UK weather conditions! Also on display inside was one of our portable flight case communications units which provides a network brain for indoor and smaller events. The unit can support up to 20 VoIP handsets and 5 wireless PODS making it perfect for press or PR launch events. The response to the two stands was fantastic; customers were keen to see the latest innovations and understand how their event can reduce costs by taking advantage of the latest technology. If you missed the Showman’s Show then Etherlive will also be exhibiting at the Event Production Show 2nd and 3rd February 2010 at Olympia, London or you can get in contact to setup a personal demonstration at any time. We exhibited in both the outside and inside areas. The outdoor space meant that we could demonstrate to customers the new Ecolite P Plus tower light, combining lighting, CCTV, public address and network (Wi-Fi & Wired) access in one palletized unit. The revolutionary unit received very positive reviews especially around its efficiency and simplicity. Also on display outside was the Mobile Command Centre (MCC), the network centre which keeps the largest events up and running with server racks, high speed networking, real-time monitoring and working space for operational teams. Also on display inside was one of our portable flight case communications units which provides a network brain for indoor and smaller events. The unit can support up to 20 VoIP handsets and 5 Wi-Fi PODS making it perfect for press or PR launch events. The response to the two stands was fantastic; customers were keen to see the latest innovations and understand how their event can reduce costs by taking advantage of the latest technology. If you missed the Showman’s Show then Etherlive will also be exhibiting at the Event Production Show 2nd and 3rd February 2010 at Olympia, London or you can get in contact to setup a personal demonstration at any time.